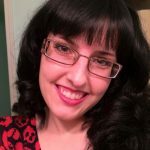 Nothing is more wonderful than coming home from a long day at work to be greeted by your faithful canine companion – unless, of course, it jumps on you and knocks you over. Large breed dogs have their challenges, but they are also a joy and a privilege to keep. If you want to keep your large breed dog happy and healthy for as long as possible, take the time to pick out a high-quality dog food. Keep in mind that large breed dogs have different needs than smaller dogs, so you’ll need to do some shopping around! Keep reading to learn more about your large breed dog’s nutritional needs and to receive some tips for picking the best dog food to meet them. You’ll also receive our top 5 picks for the best dog food for large breed dogs. How Much Should You Feed Large Breed Dogs? All dogs have the same basic nutritional needs for protein, fat, and nutrients. What you may not realize, however, is that dogs of different sizes have different needs when it comes to the ratio of those nutrients. Larger dogs also need more calories than smaller dogs, but fewer per pound of body weight. The best place to start when looking for the best dog food for large breeds is a high-quality diet formulated for large-breed dogs. This will help ensure that your dog gets the protein it needs to build healthy muscle without so much fat that it becomes overweight or obese. In terms of specific nutritional needs, your dog requires at least 18% crude protein, 5% crude fat, and no more than 5% fiber in its diet. That is the bare minimum, however, so keep that in mind. When it comes to protein and fat, your dog will be able to digest animal-based ingredients better than plant-based ingredients. Meat, poultry, and fish are excellent sources of protein for dogs, and healthy fats include things like chicken fat and salmon oil. Your dog can digest certain carbohydrates as well like whole grains, starchy vegetables, beans, and legumes, but protein should be the star of its diet. In addition to protein, fat, and digestible carbohydrates, your large breed dog can benefit from certain supplements. Probiotics, for example, help to ensure smooth and regular digestion while chelated minerals provide a biologically valuable source of key nutrients. Glucosamine and chondroitin are also important for large-breed dogs to support their bone and joint health. Keep reading to see our top 5 recommendations for the best dog food for large breeds. Chicken Meal, Ground Brown Rice, Ground White Rice, Oatmeal, Chicken Fat (Preserved with Mixed Tocopherols), Dried Beet Pulp, Pork Meal, Anchovy & Sardine Meal, Dried Egg Product, Flaxseed, Pumpkin, Carrots, Cranberries, Tomato Pomace, Dehydrated Alfalfa Meal, Potassium Chloride, Apples, Peas, Organic Quinoa, Vitamins [Vitamin E Supplement, Beta-Carotene, Ascorbic Acid (Vitamin C), Niacin Supplement, Vitamin B12 Supplement, Vitamin A Supplement, D-Calcium Pantothenate, Pyridoxine Hydrochloride, Vitamin D3 Supplement, Thiamine Mononitrate, Riboflavin Supplement, Biotin, Folic Acid], Minerals [Zinc Polysaccharide Complex, Iron Polysaccharide Complex, Copper Polysaccharide Complex, Manganese Polysaccharide Complex, Sodium Selenite, Cobalt Carbonate, Potassium Iodide], Papaya, Glucosamine Hydrochloride, Dried Kelp, Taurine, Blueberries, Pomegranate, L-Carnitine, Inulin, Mixed Tocopherols Added to Preserve Freshness, Yucca Schidigera Extract, Dl-Methionine, Ground Cinnamon, Ground Fennel, Ground Peppermint, Dried Lactobacillus Acidophilus Fermentation Product, Dried Lactobacillus Casei Fermentation Product, Dried Enterococcus Faecium Fermentation Product, Dried Bacillus Subtilis Fermentation Product, Dried Bacillus Licheniformis Fermentation Product, Dried Aspergillus Oryzae Fermentation Product, Dried Aspergillus Niger Fermentation Product, Lecithin, Choline Chloride, Rosemary Extract, Green Tea Extract. 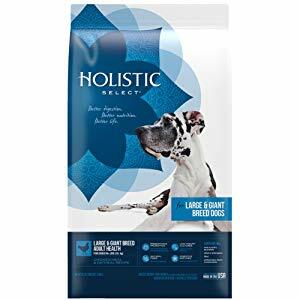 If you want to give your large breed dog the best of the best, this Holistic Select formula is a great option. Made with all-natural ingredients and free from fillers, by-products, and artificial additives, you can feel good about feeding your dog this product. It features chicken meal as the first ingredient with whole grain carbohydrates, healthy fat, and fresh fruits and vegetables for nutritional balance. 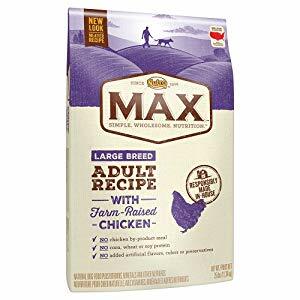 For a quality dog food that won’t break the bank, consider Nutro Max Large Breed Adult Chicken Recipe dry food. This formula features farm-raised chicken as a protein-rich first ingredient with digestible carbohydrates like whole grain sorghum and whole grain oatmeal. Plus, it is rich in glucosamine and chondroitin to support your dog’s bones and joints. Chicken, Chicken Meal (source of Glucosamine and Chondroitin Sulfate), Brewers Rice, Split Peas, Whole Grain Sorghum, Whole Brown Rice, Chicken Fat (preserved with Mixed Tocopherols), Pea Protein, Lamb Meal (source of Glucosamine and Chondroitin Sulfate), Dried Sweet Potato, Natural Flavor, Dried Plain Beet Pulp, Fish Oil (preserved with Mixed Tocopherols), Potassium Chloride, Salt, Choline Chloride, DL-Methionine, Dried Apples, Dried Blueberries, Dried Carrots, Mixed Tocopherols and Citric Acid (preservatives), Zinc Sulfate, Niacin Supplement, Biotin, Vitamin E Supplement, Iron Amino Acid Chelate, D-Calcium Pantothenate, Riboflavin Supplement (Vitamin B2), Selenium Yeast, Vitamin B12 Supplement, Copper Amino Acid Chelate, Pyridoxine Hydrochloride (Vitamin B6), Manganese Amino Acid Chelate, Vitamin A Supplement, Thiamine Mononitrate (Vitamin B1), Vitamin D3 Supplement, Folic Acid, Rosemary Extract. 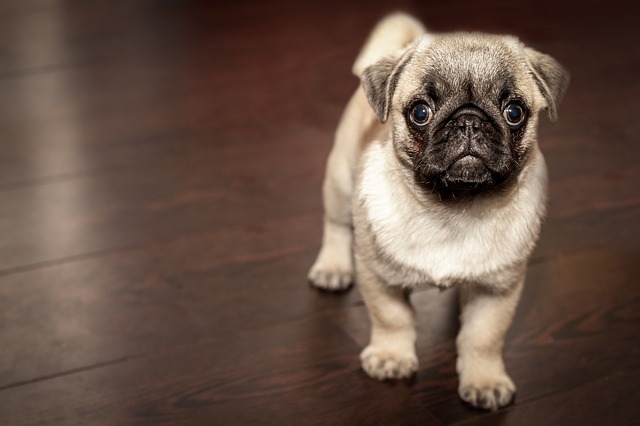 Large-breed puppies need a protein-rich diet to support their growth and development with controlled levels of fat, calcium, and phosphorus to prevent overgrowth. 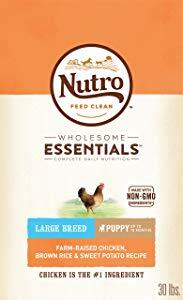 This Nutro Wholesome Naturals recipe is uniquely formulated for large-breed puppies to meet those needs and more. As your large breed dog gets older, its metabolism slows down, so you need a recipe rich in protein to support lean muscle mass with limited fat to prevent obesity. 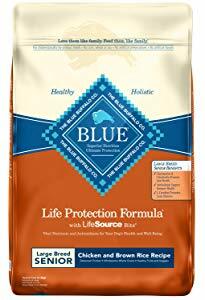 This Blue Buffalo Life Protection formula features chicken and brown rice in a nutritionally complete recipe designed specifically for large breed seniors. As an added bonus, it contains Blue Buffalo LifeSource Bits for vitamins, minerals, and antioxidants. If your large breed dog suffers from food allergies or sensitivities, a limited ingredient diet may be the way to go. 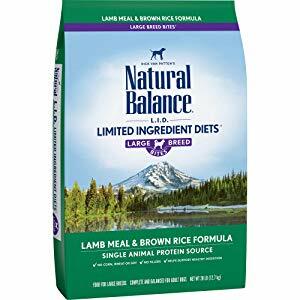 This Natural Balance LID features a single source of animal protein, lamb, with digestible brown rice for carbohydrate support. It is designed to encourage healthy digestion and also helps support your dog’s dental health as it ages. The amount you feed your large breed dog will change over the course of its life. As a puppy, you need to make sure your dog gets enough food to grow and develop but not so much food that it grows too quickly. 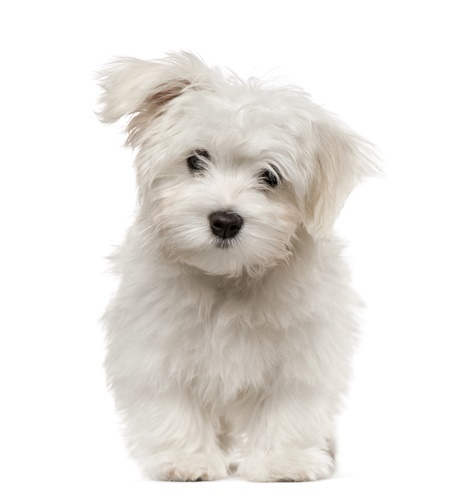 Growing too fast can increase the risk that your puppy will develop musculoskeletal problems as an adult. This is why it is important to choose a large-breed puppy food – to control its growth. The best way to determine how much to feed your large breed dog is to read the feeding recommendations on the package. Check the chart for your dog’s age, and size then follow the advice! Remember that the recommendation is for a whole day, so you’ll want to divide it into two smaller meals and space them out throughout the day. 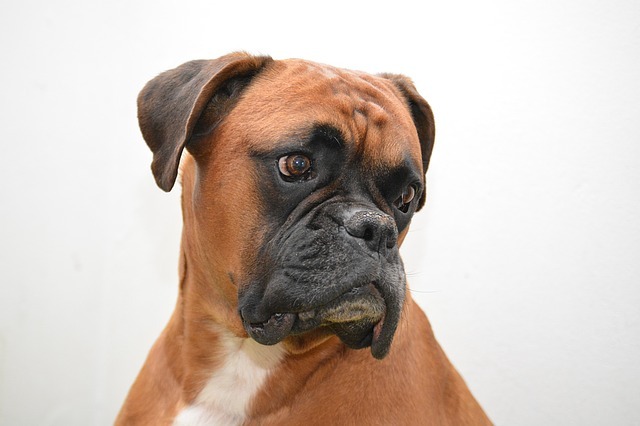 All dogs have the potential to develop food allergies and sensitivities – it is not limited to large breeds. If your dog develops recurrent ear infections, digestive upset, or skin problems, then it could be due to something in its food. The best way to deal with a food allergy or sensitivity is to switch your dog to a limited ingredient diet made with a novel source of protein and carbohydrate – something it hasn’t eaten before. 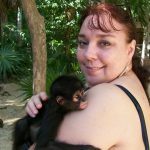 After about 12 weeks on the new diet, its symptoms should disappear! Large breed dogs may require a larger volume of food than smaller breeds, but they need a recipe that is rich in protein and lower in fat. The best place to start is with a high-quality dog food formulated for large breeds so you can ensure that your dog’s needs are met without going overboard on calories. If you’re not sure where to look, try one of our top 5 picks for the best dog food for large breeds above!